Do you suffer from chronic neck pain? There could be many reasons why you suffer from this condition. You may have been involved in an accident, slept in the wrong position, or placed a strain on your neck while working on the PC. We know how unbearable the pain can become as you cannot move your head from one side to another. You can have the pain relieved by a chiropractor, massager, or even acupuncture but becomes expensive. 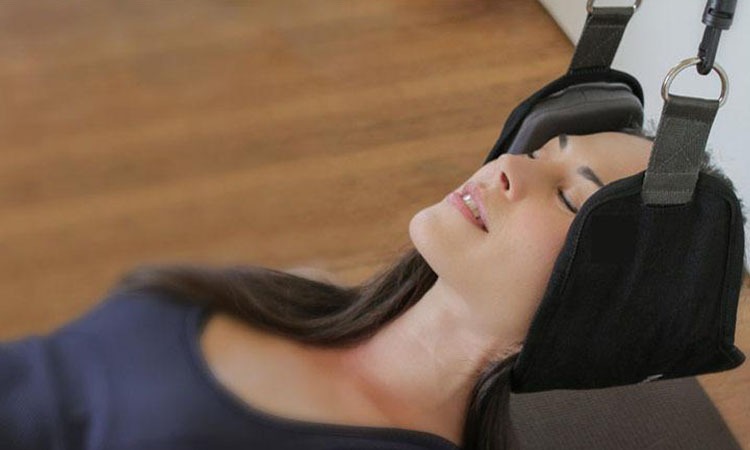 We have good news for you by using a neck traction device at home you can relieve your neck pain without the need of spending hundreds in visiting a chiropractor every week. You may want to check out our best picked neck traction devices reviewed here for your best needs. Therefore, if you want a natural drug-free way to ease your neck pain, the cervical traction device can help. The apparatus is small and easy to carry with you to work, and when used correctly it can even relieve headaches, neck pain, and shoulder pain. 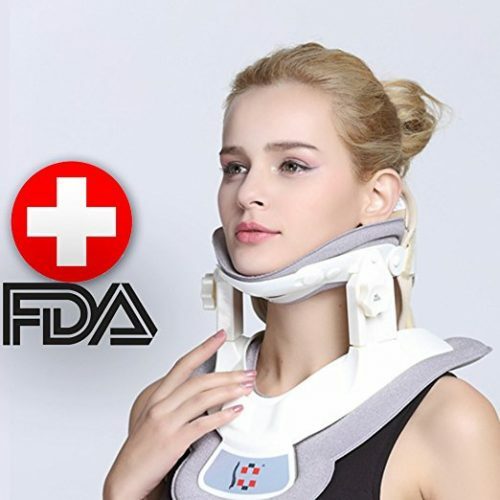 Check our top 10 neck traction devices in 2019 out here. For an affordable solution to relieve pain from an injury, you need the cervical collar support from Vive. The neck brace supports your jaw and neck and limits mobility to help alleviate the pressure in your spine. The collar has a soft foam structure, and you can wear it while sleeping or throughout the day while working. 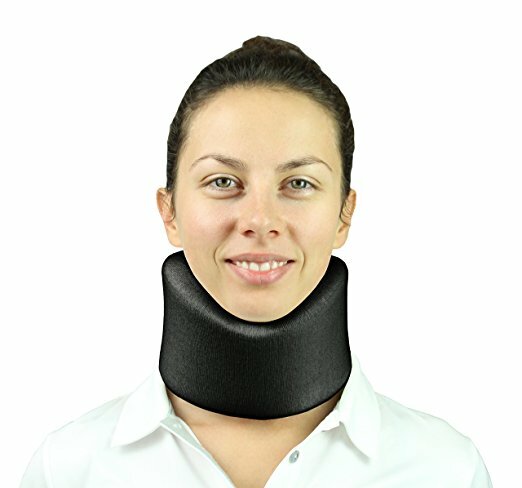 The neck brace is comfortable to put on, wraps around the neck, and secures with Velcro straps. 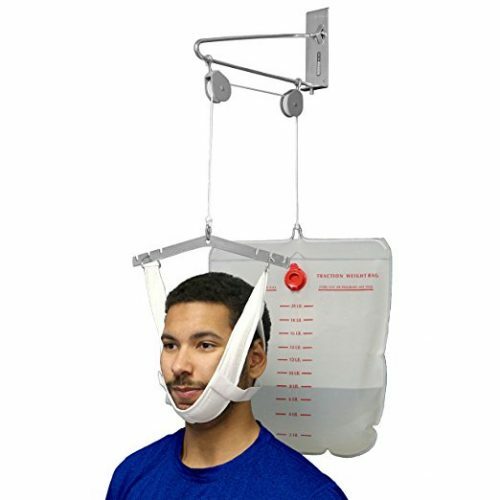 The neck traction device accommodates neck sizes ranging from 15-inches to 20.5-inches. The material has a breathable design made of latex-free foam, and you receive a 60-day guarantee with the product. Another affordable neck traction device to help relieve head & shoulder pain is the DDJ Cervical Neck Brace. According to the manufacturer, you only need to use it up to three times daily for up to 20 days. You can wear it to maintain the correct neck posture when sitting in front of your PC. The triple tier inflation system is easy to use and adjust with Velcro straps. 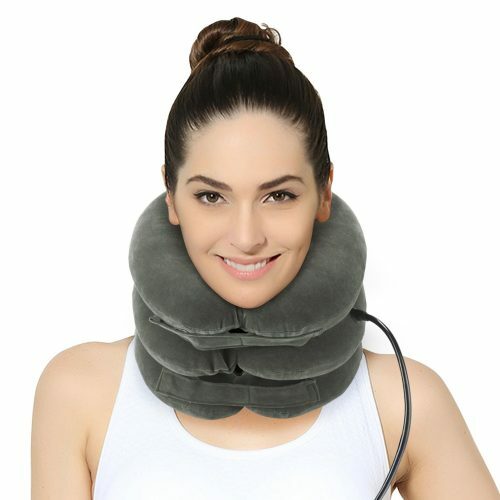 The neck pillow has a snug fit and fits most necks. However, there is a health warning. If you suffer from cardiovascular disease, you cannot wear the cervical neck brace. For effective neck pain relief, you need the OasisSpace Medical Grade Neck Traction Device. The neck collar has a breathable soft design and inflates for a perfect fit. You control the pressure yourself, and for an ideal fit, you use the Velcro straps to keep it secure. The neck traction brace you can wear twice a day for up to 20-minutes for a month to help relieve neck and shoulder pain. With the portable design, you can take it anywhere, and you get 120-day money back guarantee. 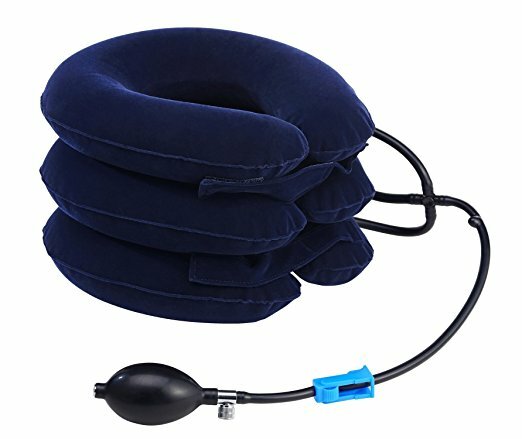 The Banglijian neck traction device has a triple tier inflation system that is soft and comfortable to wear. Included is a sure-stay bulb pump and has adjustable Velcro straps to adjust for a great fit. You can wear it twice a day for up to 30-minute for longtime relief. With the small design, you can take it with you anywhere, and it is easy to use. You receive a one-year warranty included. To keep the device packed and secure you receive a storage bag extra. With the ONTEN cervical neck brace, you get a folding design and fully adjustable. You can take it with you to work or on travels to help relieve chronic neck pain. 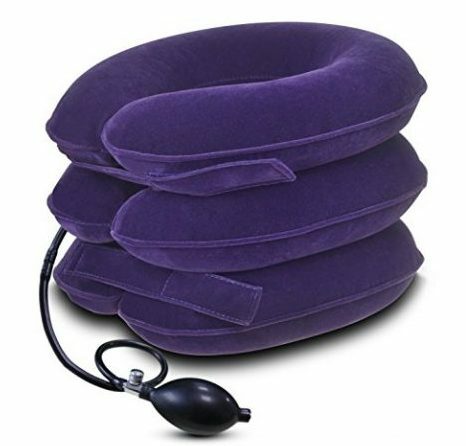 The pillow pumps up with air and is fully controllable by you. The fantastic news is you can use the neck brace to alleviate neck spasms, shoulder pain and more. The device is easy to use by placing it around your neck and securing it with the Velcro straps. Once you feel comfortable, you pump it up with air. The next neck traction device is different to other neck braces. Here we have the OTC over door cervical traction kit. You can quickly set it up in your home, as the metal brackets are sturdy and fasten over any door. The head halter fits most adults as it has an adjustable size. The weight bags calibrated from 2 lbs – 20 lbs and made of latex-free material. You can use the apparatus to treat vertebral joint pain, muscle spasm, and more. The weight bag you fill with water and include a traction cord to adjust according to your height. 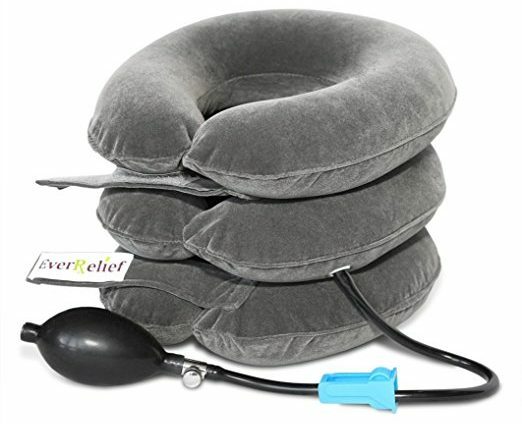 For an FDA registered cervical neck traction device look at EverRelief®. The traction device helps support your neck and elevates your jawbone at the same time. There is no assembly needed and includes systematic instruction on how to use the neck brace. The apparatus is small to take with you anywhere, and you control the amount of airflow for a comfortable fit. The neck brace fits up to 17.5-inch neck sizes. The exteriors covered with soft Velvet material. 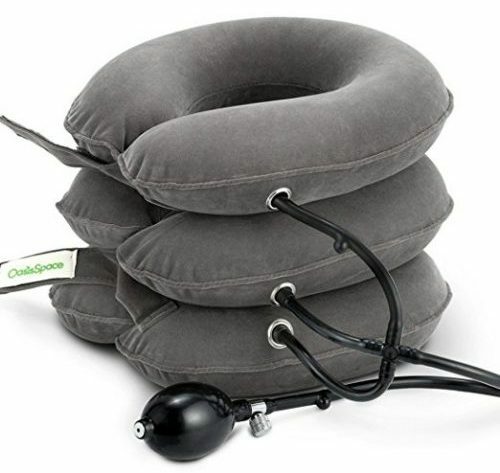 The P PURNEAT neck traction pillow has a unique design. Once filled with air the neck brace the front side is lower than the back and more comfortable to wear. You receive a significant sized inflatable ball with a metal bleeder valve to fill with the right amount of air. The apparatus constructions comprise wool fabric and are skin-friendly, and you can remove it for washing. The included pipe system you can split into two sections for cleaning. 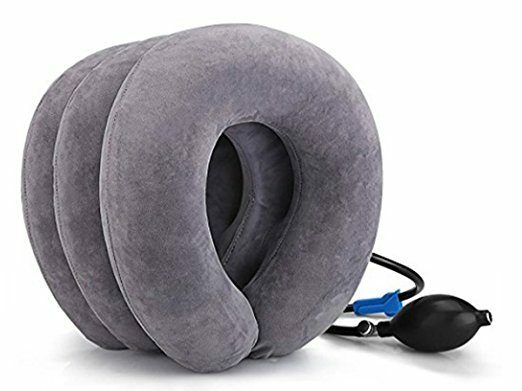 Have you recently had an automobile accident and need fast recovery from your neck injury look at the Lumenon neck traction pillow. The cervical neck brace helps increase blood circulation at the same time and corrects your neck posture. The device has a soft fabric structure and inflates quickly. The support is fully adjustable and fits most neck sizes. To keep the neck collar secure it has adjustable Velcro straps. The Jimugor neck traction device has a unique design and offers you sufficient traction. The neck brace has a self-rotation switch to adjust the traction based on your preference. The bottom of the apparatus has a recoil pad that helps stretch the vertebra distance. 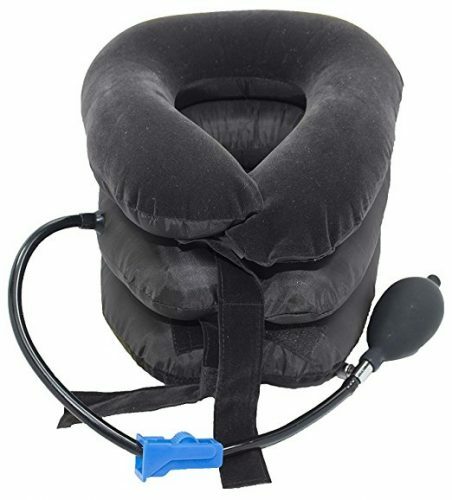 There are also eight inflatable columns making it one of the most effective neck traction devices available on the market. The switch controls easily in reach. Does not hold air well and you can fix it by setting the desired pressure, disconnect the hose, once clamped together the valve system helps depress air and fully closes the system to prevent air leakage. There is no need of spending thousands of dollars if you have chronic neck pain. With any of the Top 10 Neck Traction Devices in 2019 reviewed here, you can save loads of money on a chiropractor and more. Each cervical neck brace works with air pressure and has adjustable straps to ensure a perfect fit. You can treat shoulder muscle spasm and improve neck posture, headaches, and more.